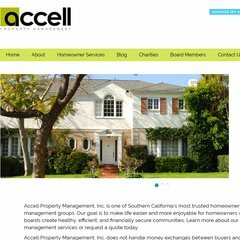 Topics: Accell Property Management, Aboutaccell, Contactus, Helpful Hoainformation, and Associationmemberservices. 66 users visit the site each day, each viewing 4.00 pages. It is written for PHP/5.3.3 language. It has 2 DNS records, ns11.worldnic.com, and ns12.worldnic.com. It is hosted by Liquid Web Inc (Michigan, Lansing,) using Apache/2 web server. PING www. (67.227.213.142) 56(84) bytes of data. The server is slower than 63% of measured websites, at 1162 milliseconds. Also a time of 17.4 ms, is recorded in a ping test.